I’ve often wondered why the magazine gunwriters and the manufacturer brochures put so much emphasis on empty weight. I don’t carry my guns empty. Do you? So in my comparisons, I load ’em up the way I carry them. That’s a full magazine and one in the chamber. When gunwriters chart out the accuracy of this gun or that gun, they’ll tell you whether it’s from a bench rest or shot free-handed, and how many inches spread with this type of ammo versus that type of ammo, etc. I’m different that way, too. I load my magazines with the kind of ammo I carry to protect myself, often mix and match because that’s what happens in real life. There are at least six types of defensive ammo I’m comfortable with and they all better impact pretty close to point of aim or the gun (or maybe the shooter) has a problem. 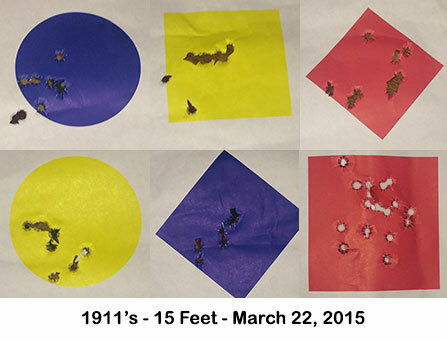 I recently took my 1911 Commanders along with a Thompson 5-inch 1911 to the range for a little confidence testing. 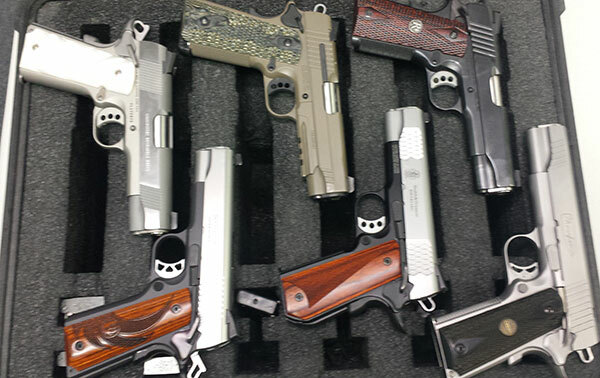 I have fully vetted the Commanders so on this shooting trip I wanted to test the 8-round Colt magazines in all 5 of the 1911 Commanders and I wanted to shoot some Hornady, Winchester, Remington and Sig Sauer Defensive Ammo mixing it up in no particular order. Also, I needed an excuse to clean the guns, so might as well dirty them up a bit. I’d never shot the Thompson, so added it to the mix. My life will be greatly simplified if these magazines work in all of my 1911s. What did I learn from the day? Let’s talk about some differences in the guns. Every one of them has a trigger pull somewhere around 5 lbs., give or take an ounce. The lightweight commanders (Colt, Ruger, S&W) all weigh in the neighborhood of 34 ounces fully loaded. The steel-framed guns are ten ounces heavier. Does that make a lot of difference? Sure, the lightweights carry easier, the heavy guns have less recoil and with my arthritis .45 caliber recoil is noticeable, though not enough to make me want to carry a smaller caliber. Not yet, anyway. The pretty logo grips I had put on the Remington were too rough on my hands. I swapped them out when I got home, putting the logo grips on a full-size R1 that I don’t shoot that much. The grips on the Sig Sauer Scorpion look aggressive, but they’re really not uncomfortable to shoot with at all. In fact, every time I do a comparison like this, I seem to shoot the Sig better than my other 1911s. I’m not sure why. Maybe it’s just inherently more accurate, maybe the grips help. I don’t know. It’s not the easiest to carry because of the squared slide and the accessory rail, but it’s sure a fine shooting gun. Three of my Commanders have the series 80 firing system and two have the series 70 system, the Ruger and the S&W. I hear old-timers say one is better than the other, but honestly, I can’t tell any difference at all. Same thing for full-length guide rod versus traditional. I can’t tell a lick of difference except when taking it apart to clean. The full-length guide rods are just slightly more difficult to take down, but not much, really. The bottom line to me is that I really am happy with my choices in carry guns and I’m content to rotate them, feeling just as comfortable with one as with any other.